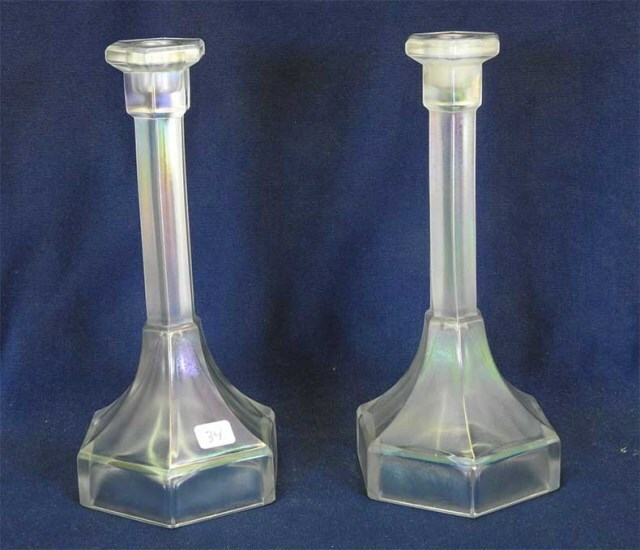 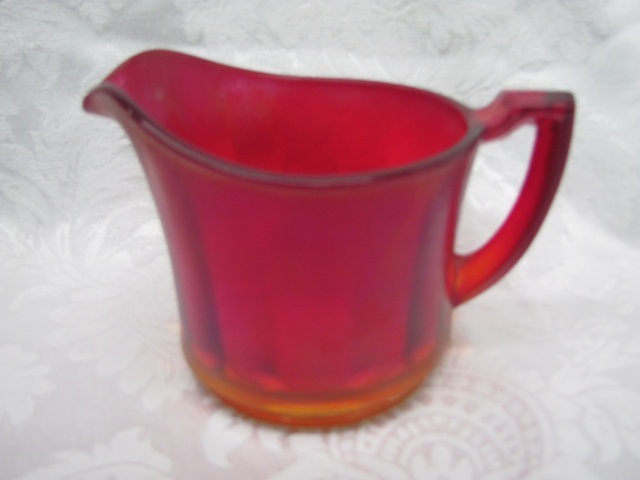 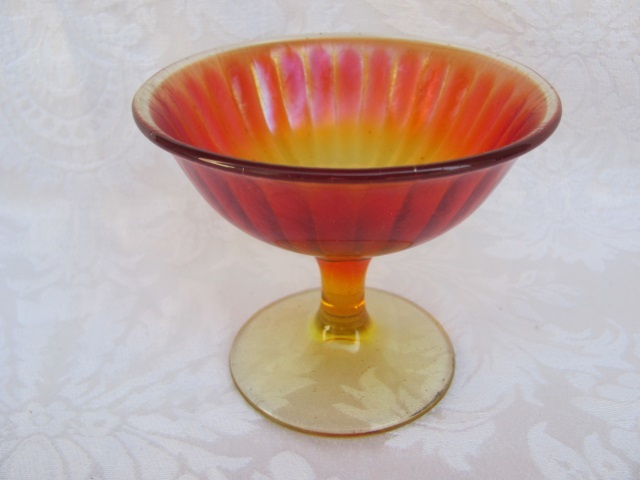 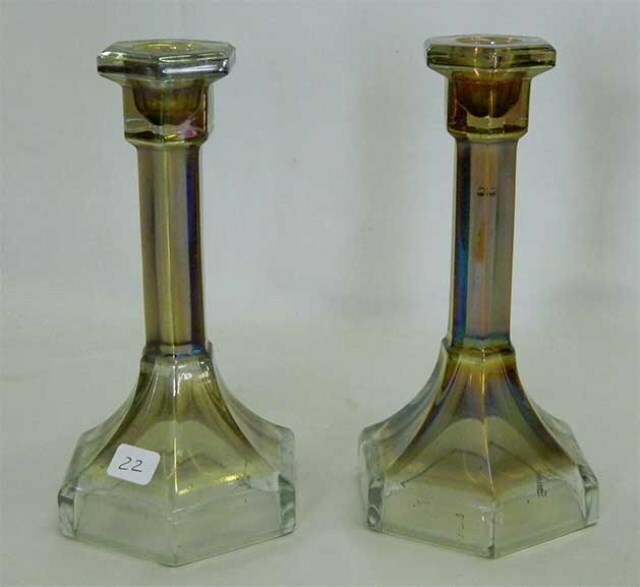 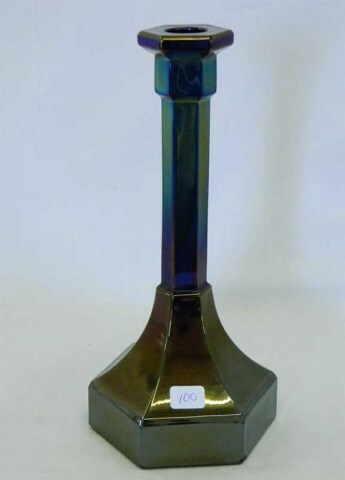 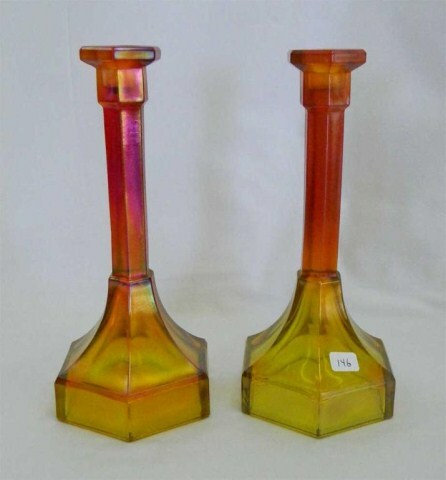 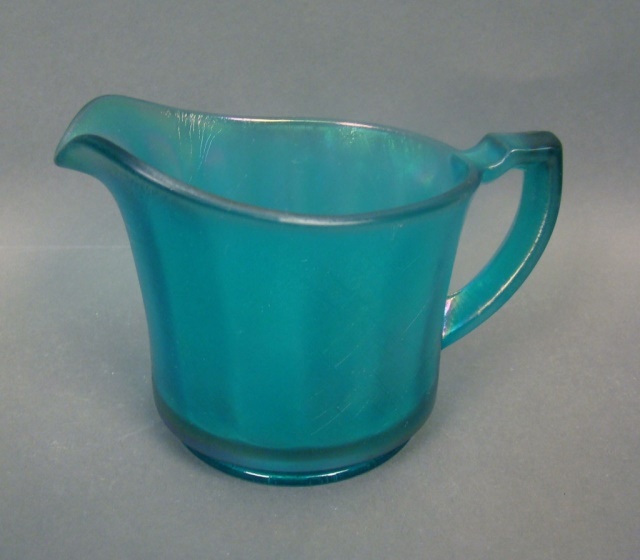 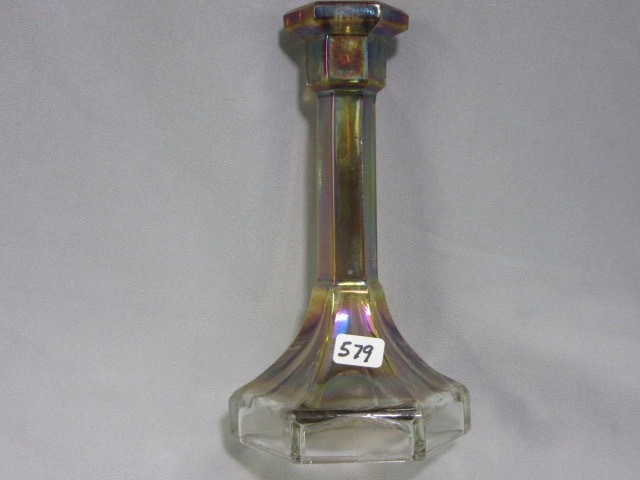 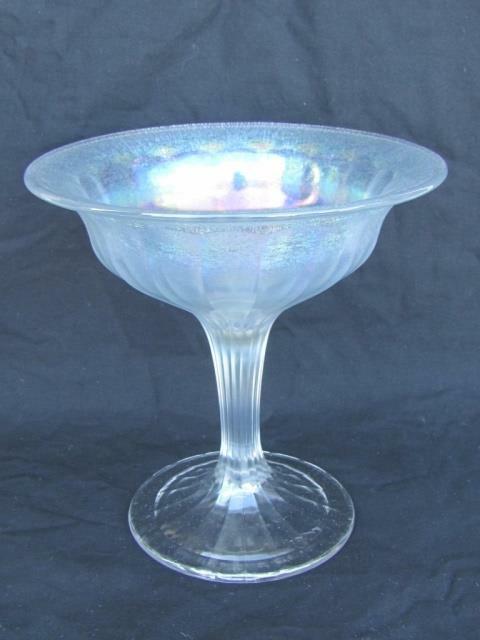 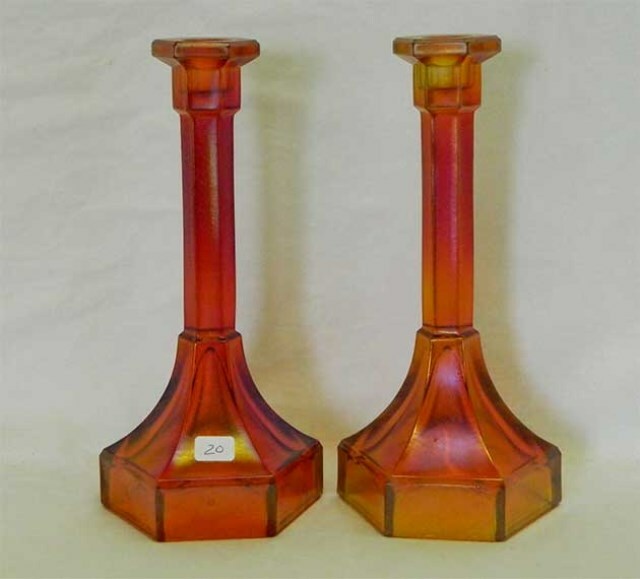 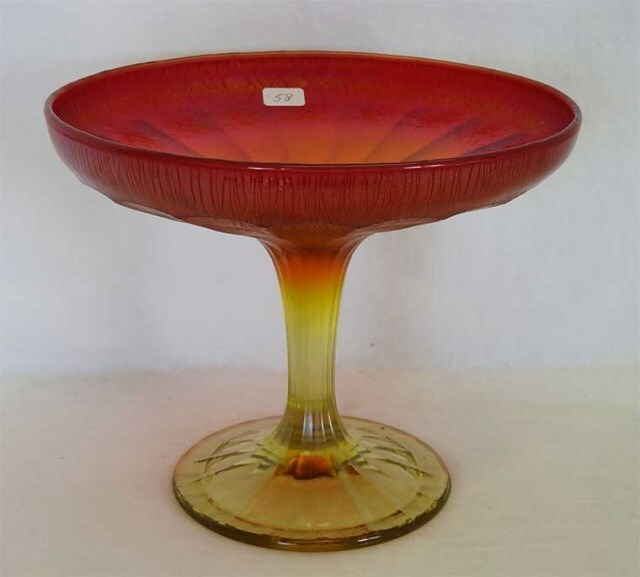 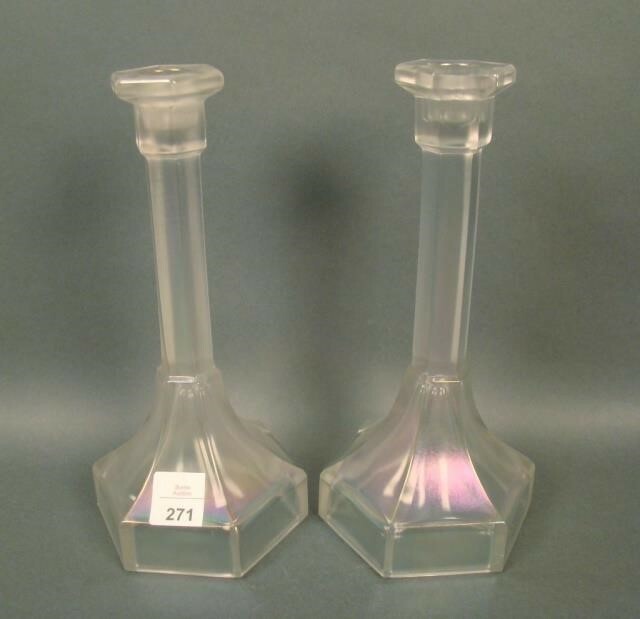 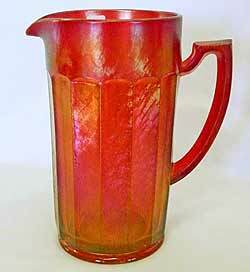 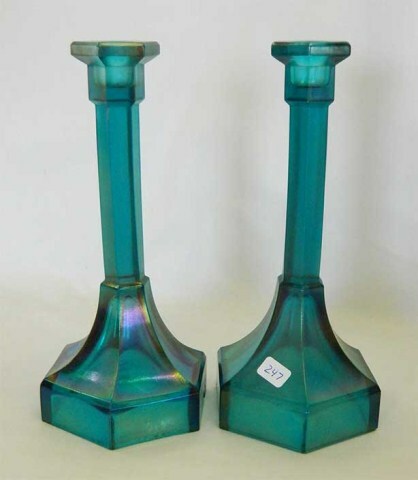 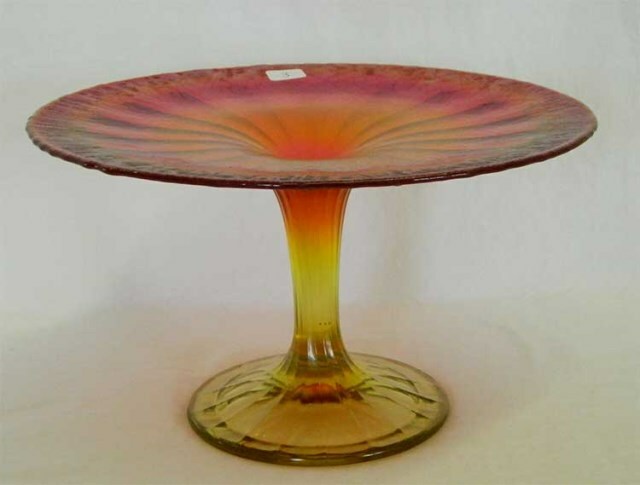 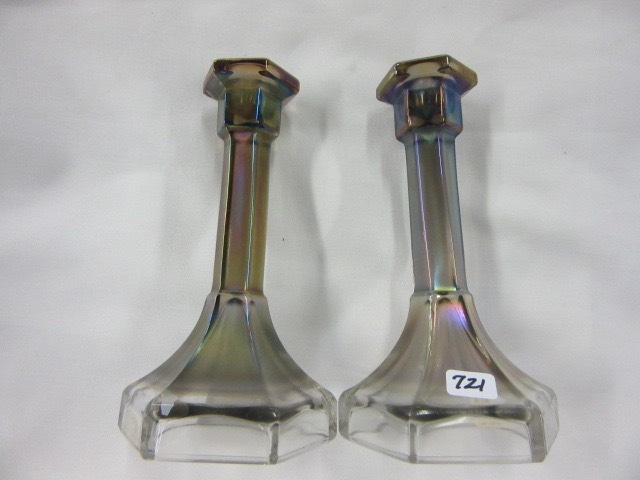 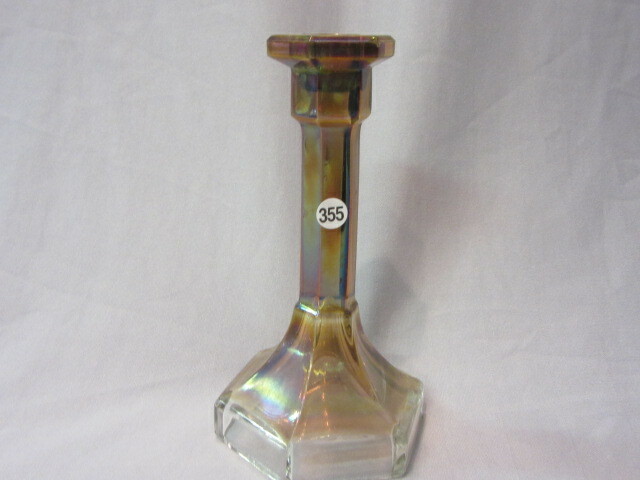 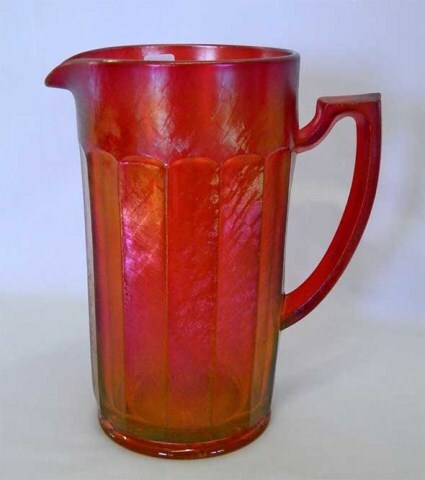 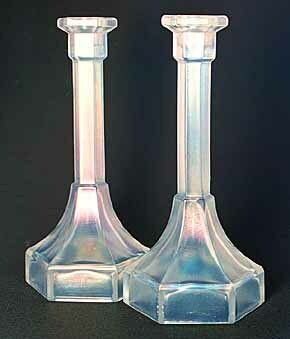 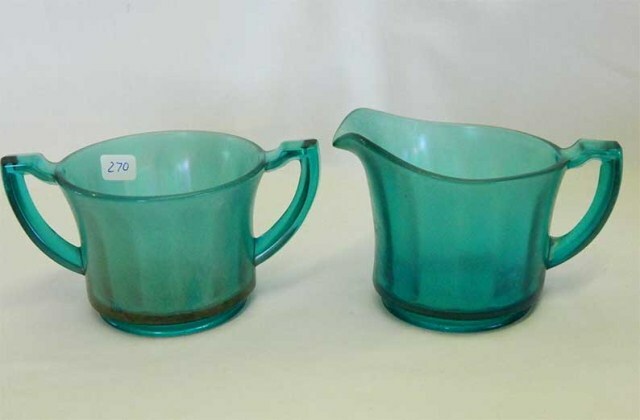 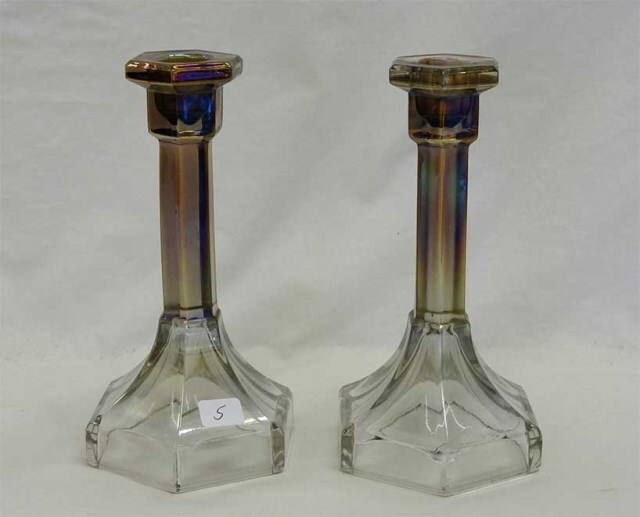 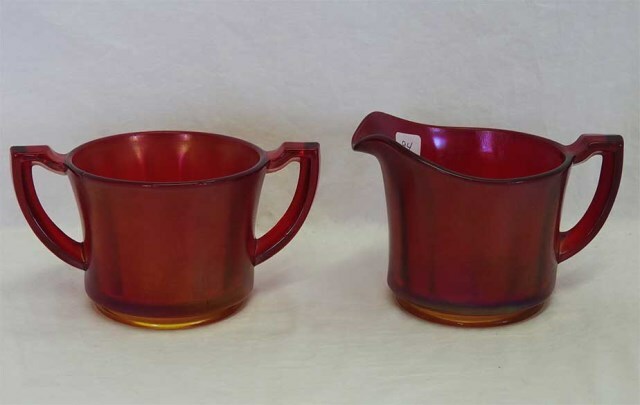 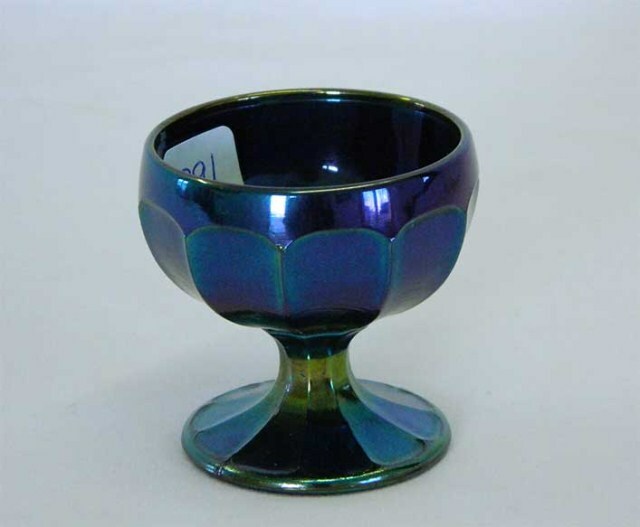 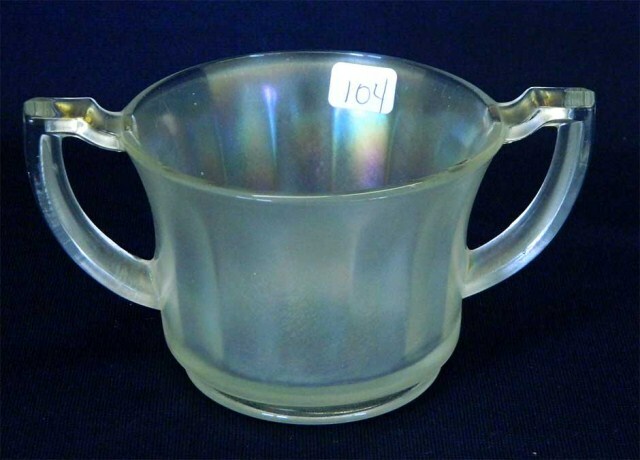 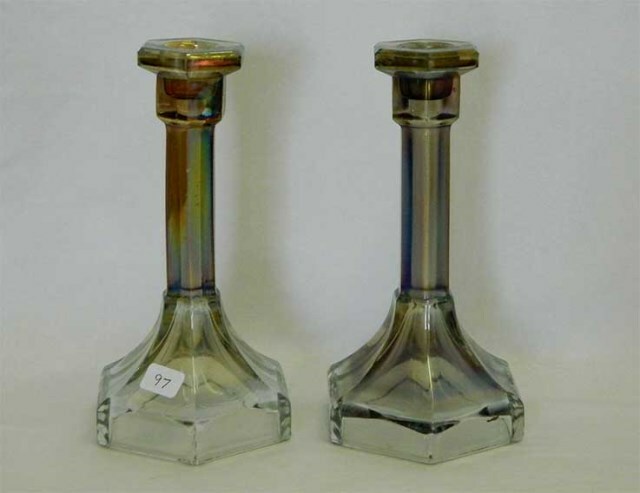 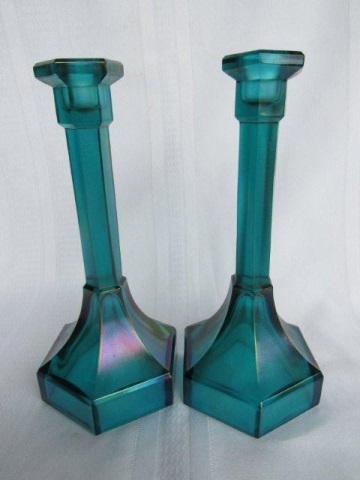 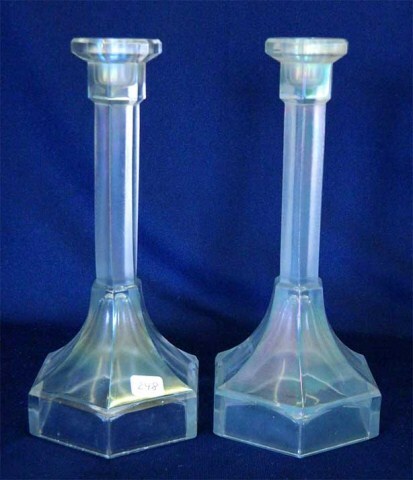 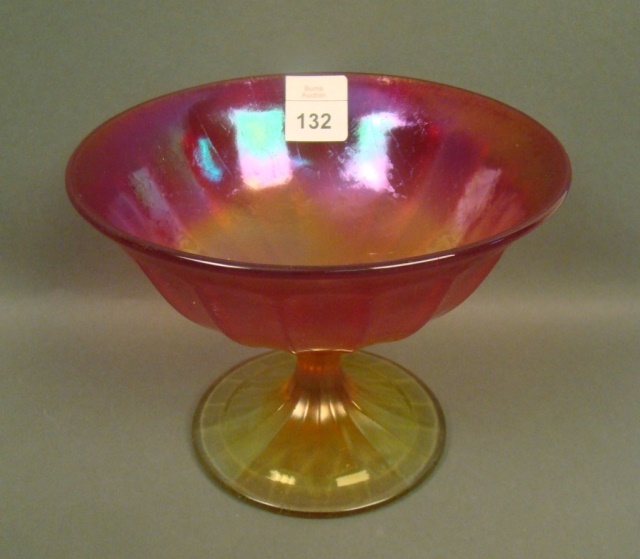 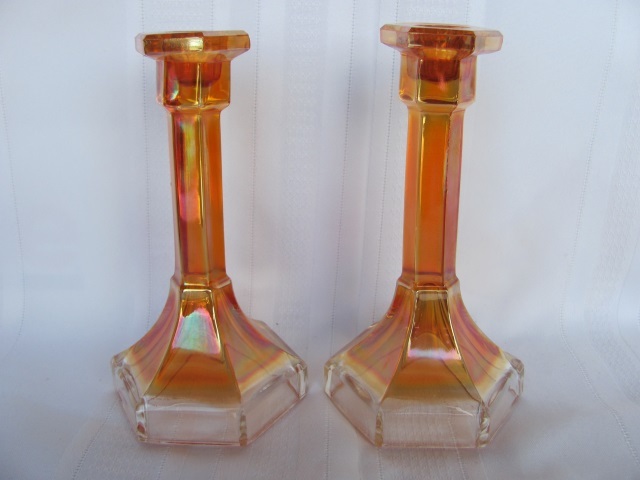 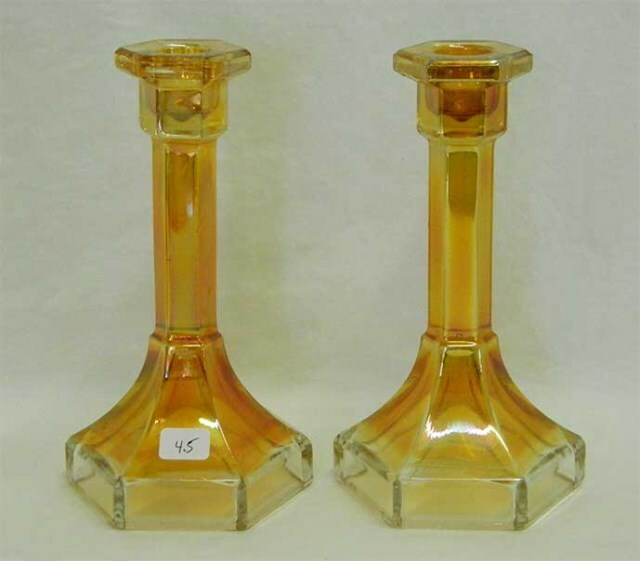 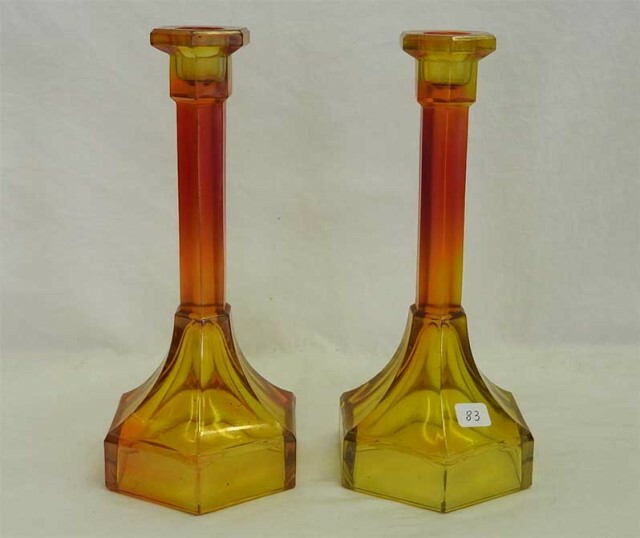 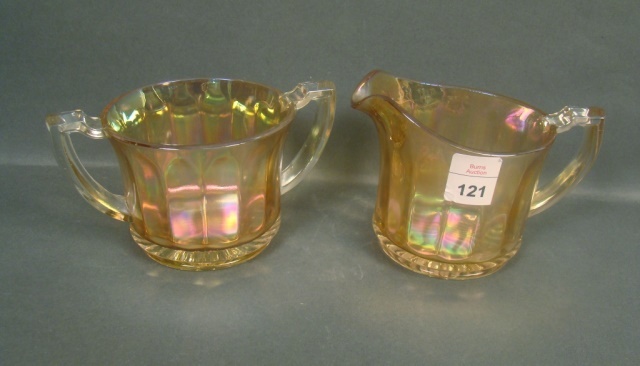 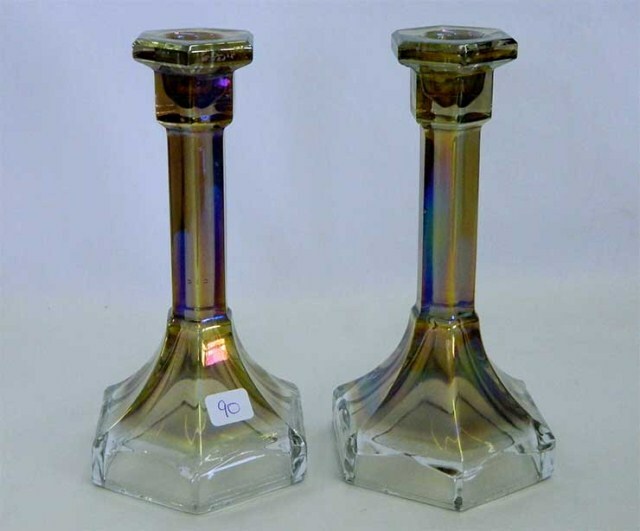 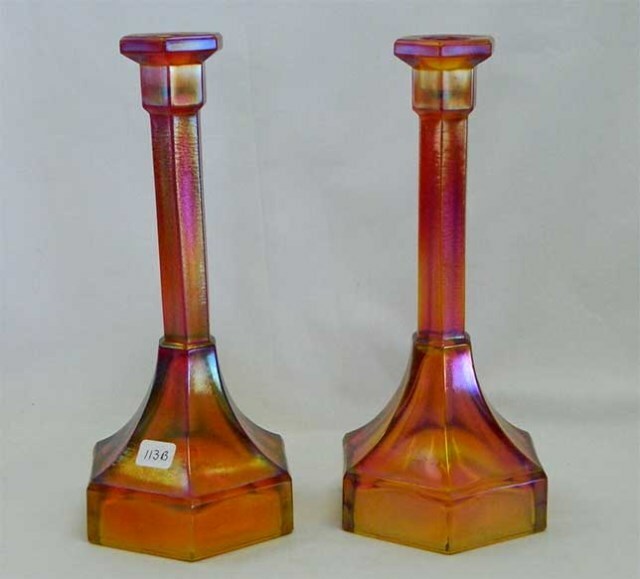 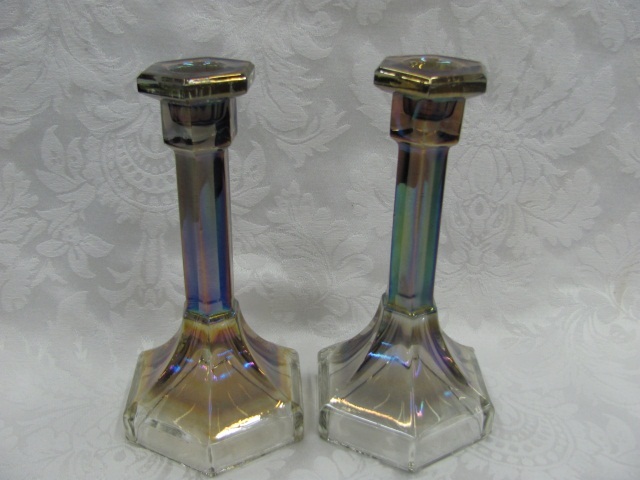 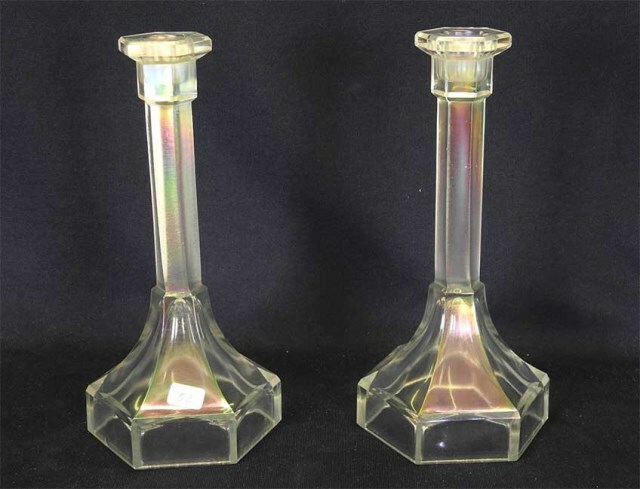 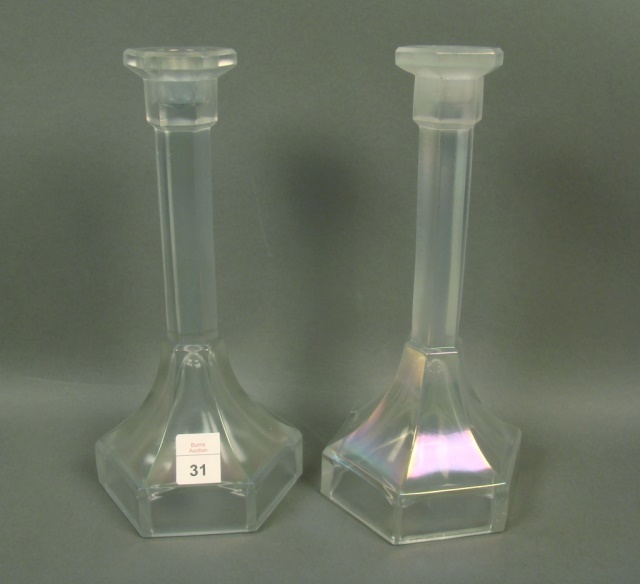 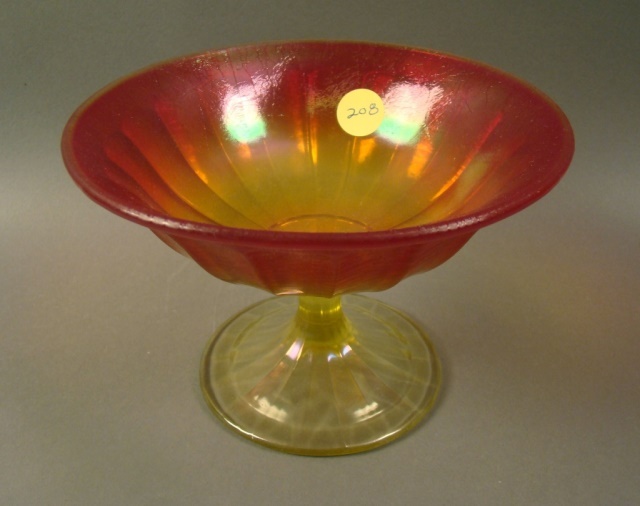 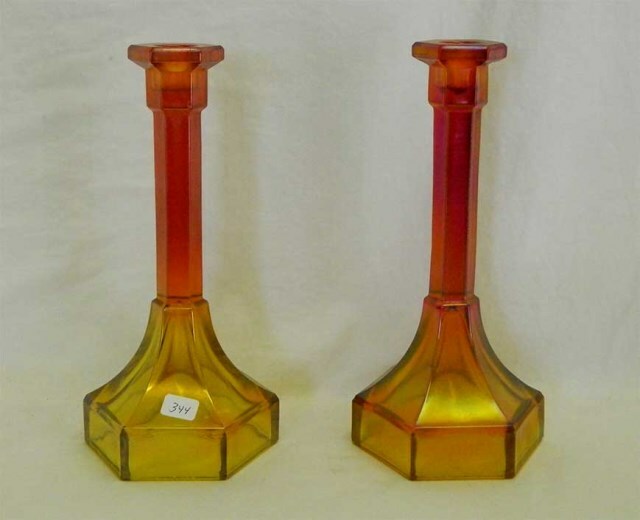 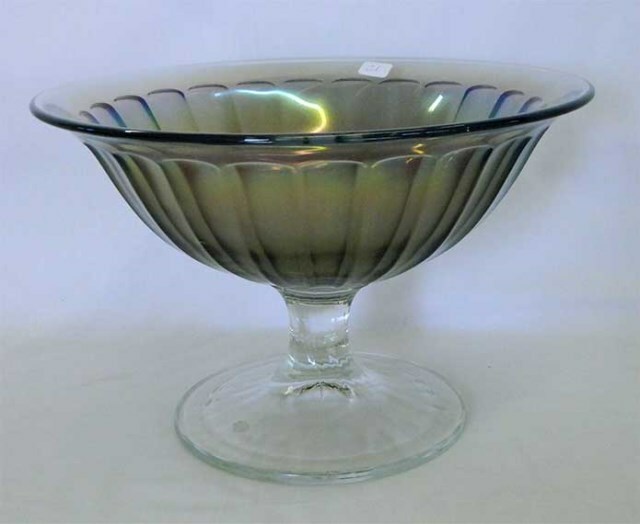 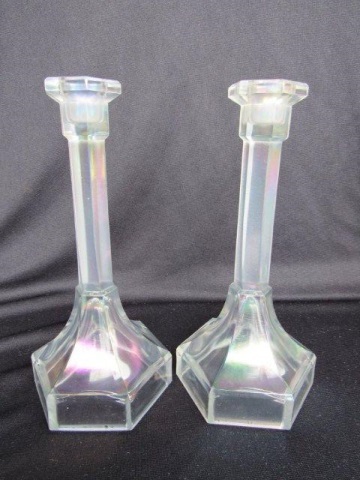 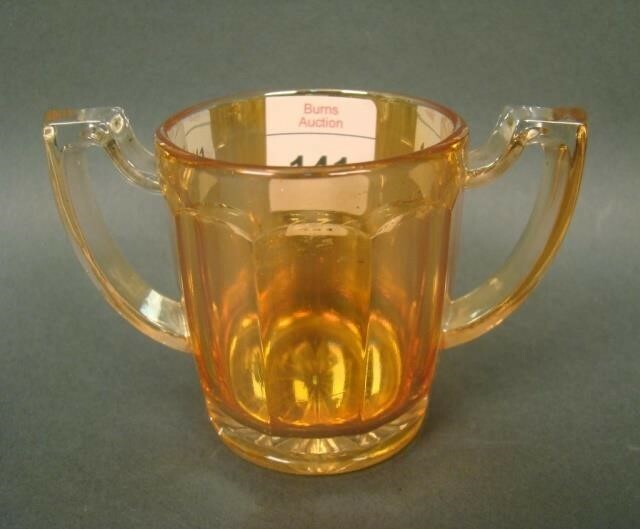 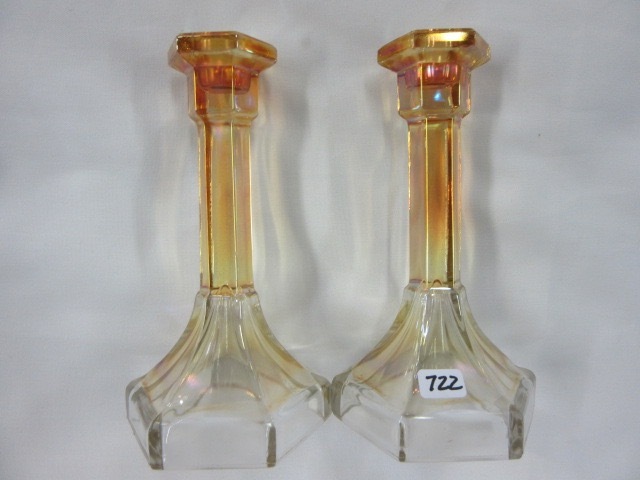 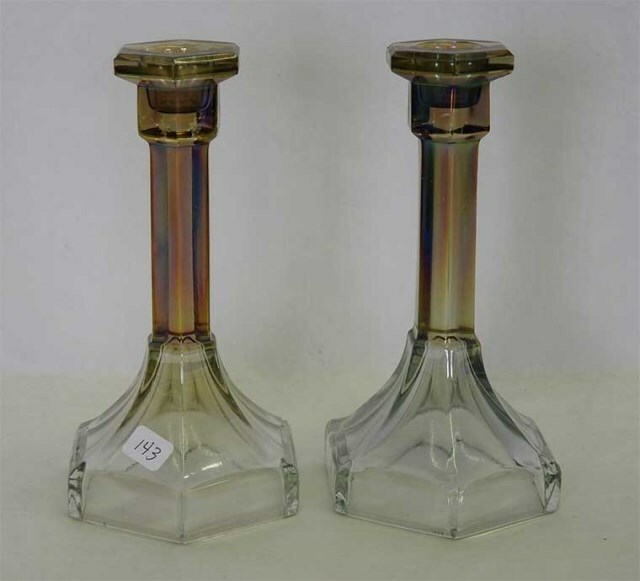 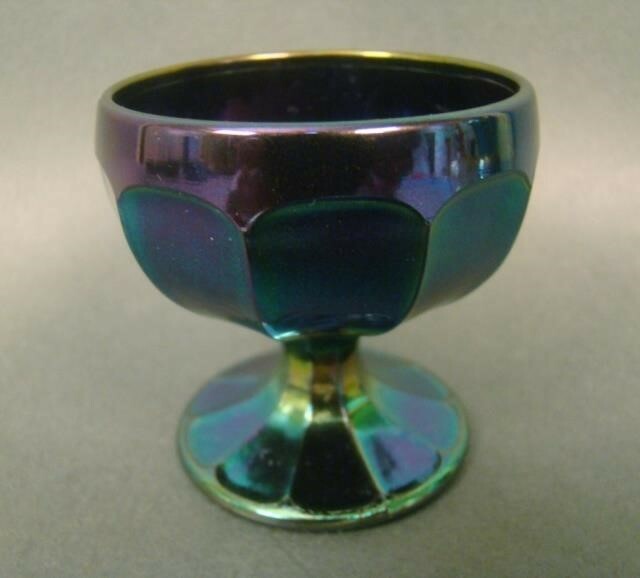 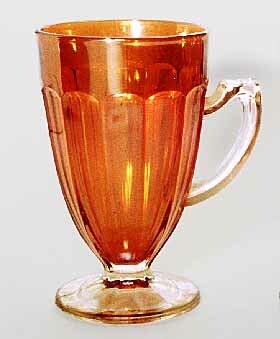 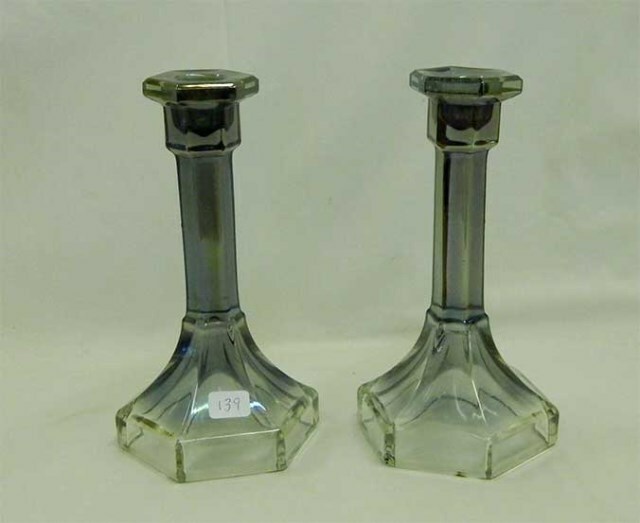 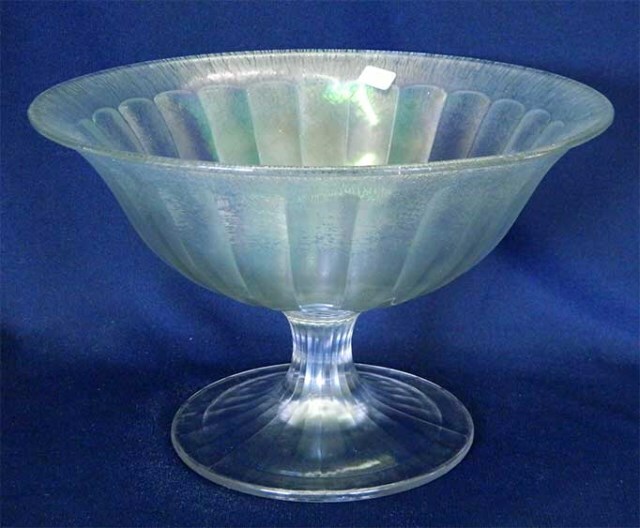 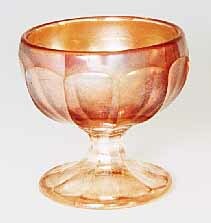 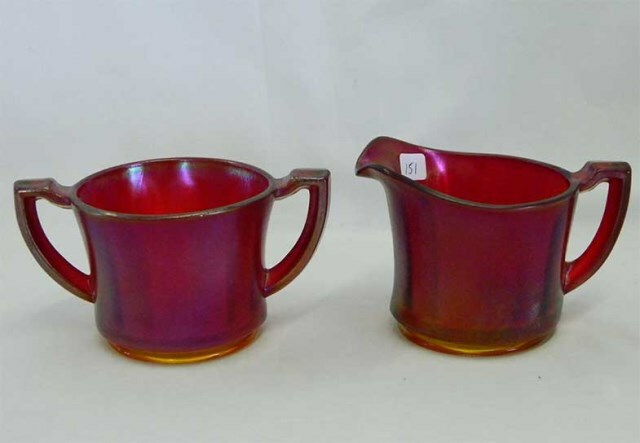 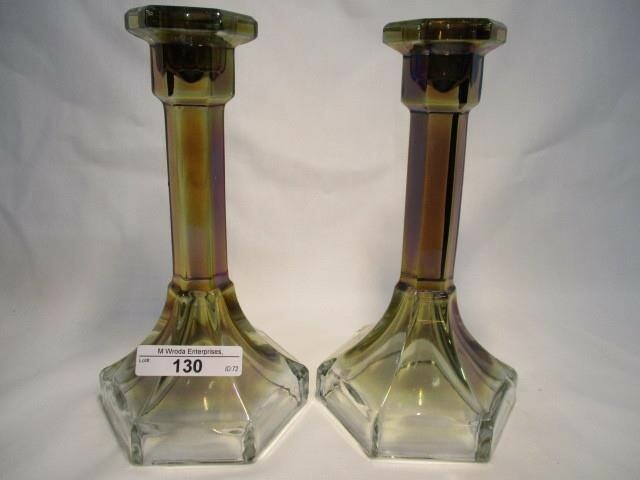 In his 1996 book on Imperial Carnival Glass, Carl O. Burns points out that the difference between the Chesterfield and similar fluted patterns is the flat portion at the top of the handle (on handled pieces, of course). 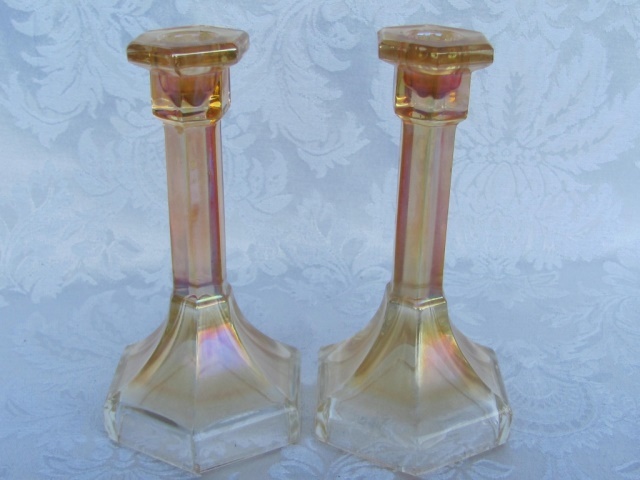 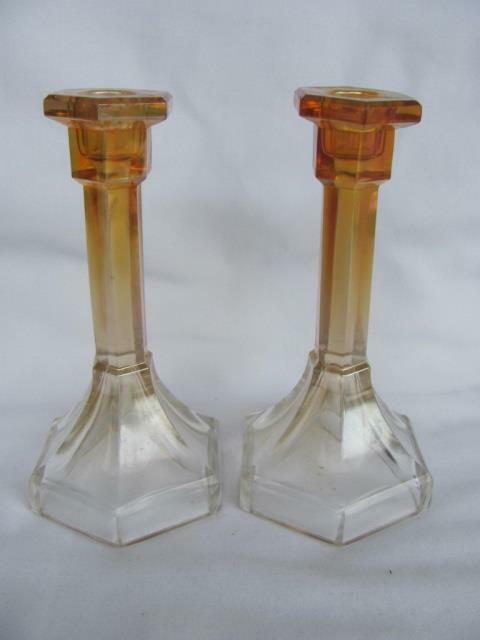 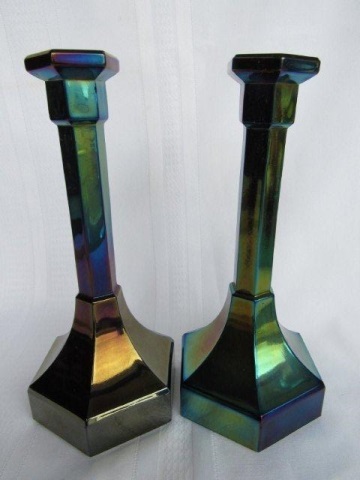 Candlesticks are found in two heights, 7 1/4 and 9 inches. 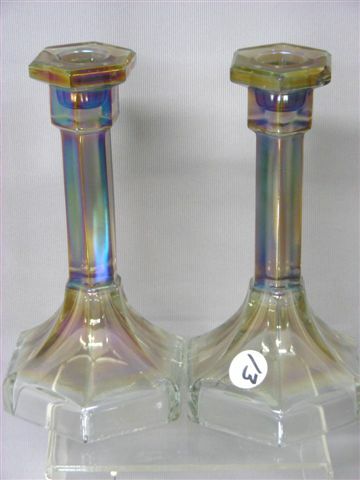 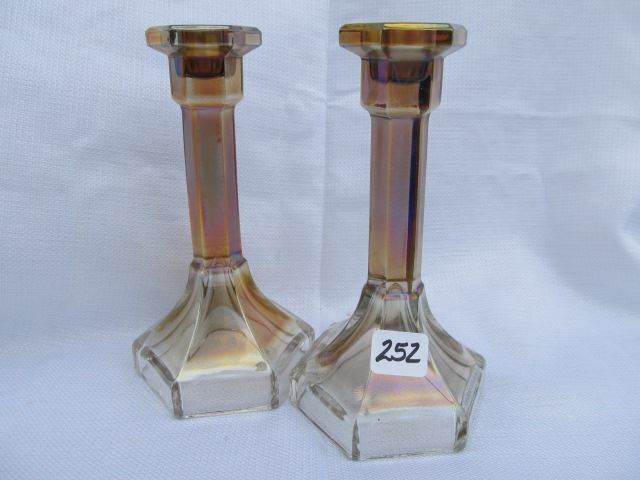 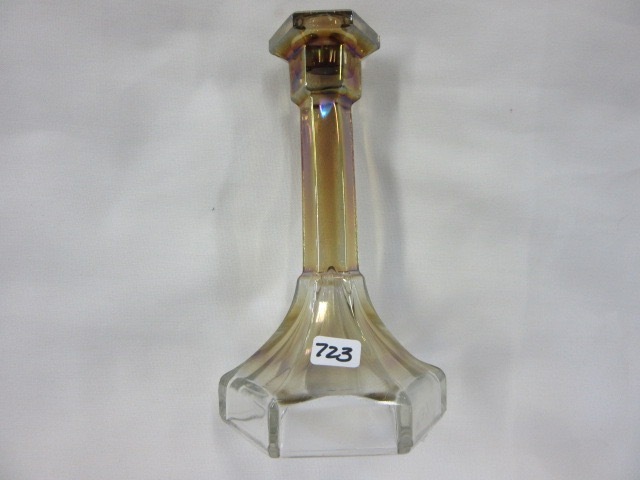 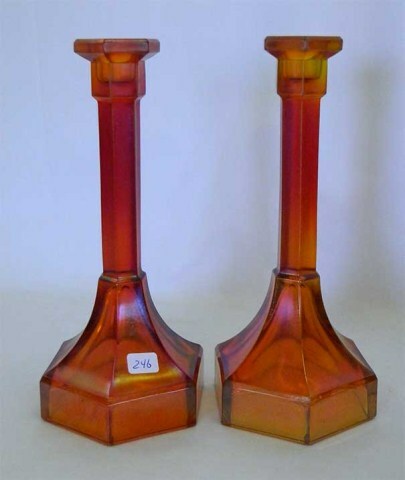 Candlesticks are reported in clambroth, marigold, purple, red, smoke, and teal as well as the white shown. 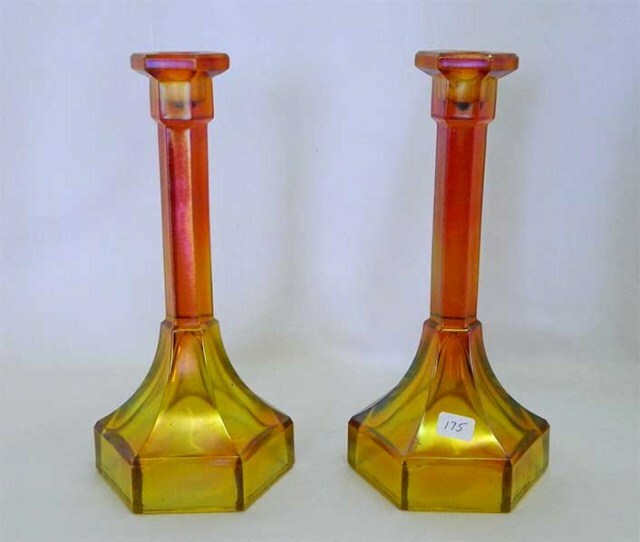 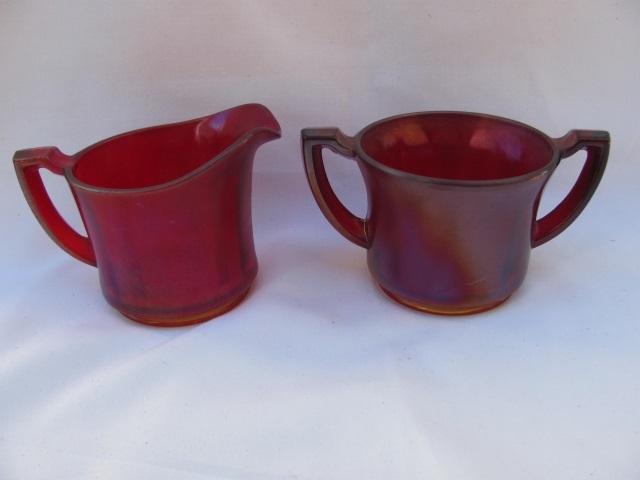 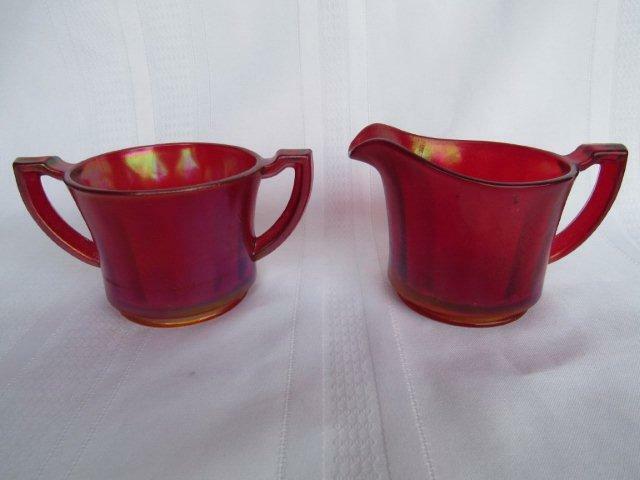 This pair is courtesy of Bob Grissom. 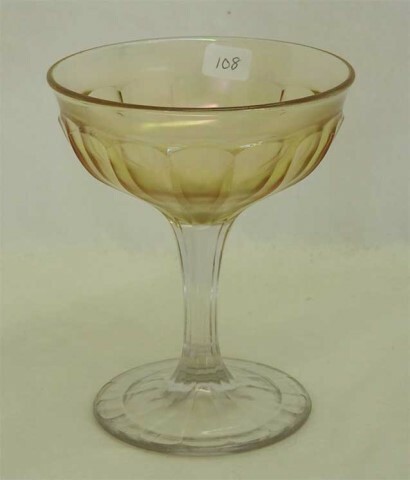 Chesterfield pieces are sometimes identified as Colonial or Wide Panel. 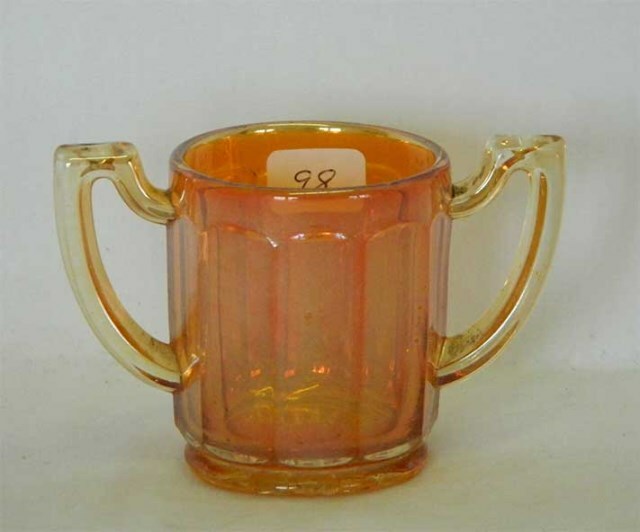 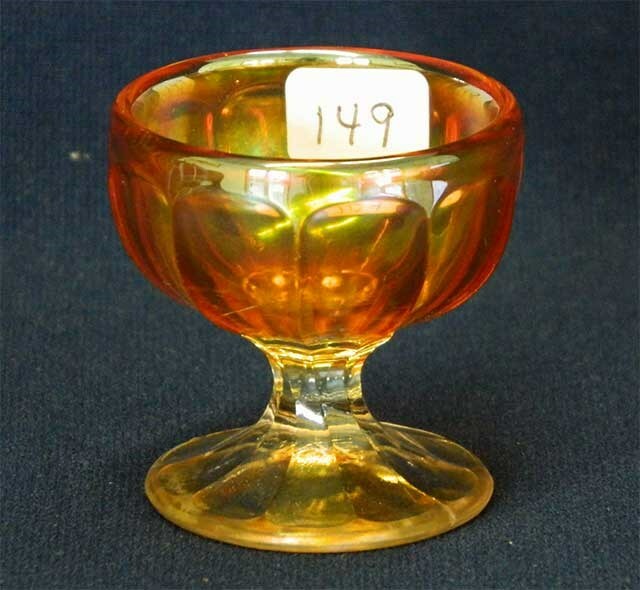 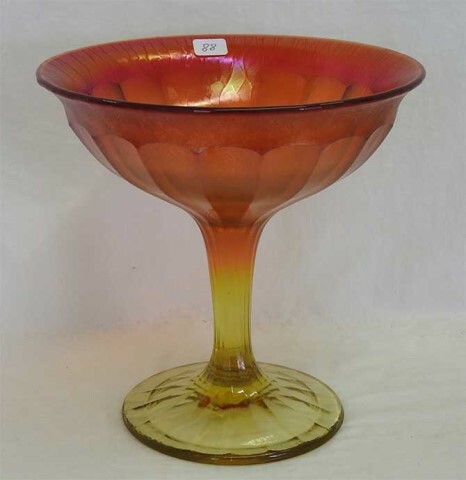 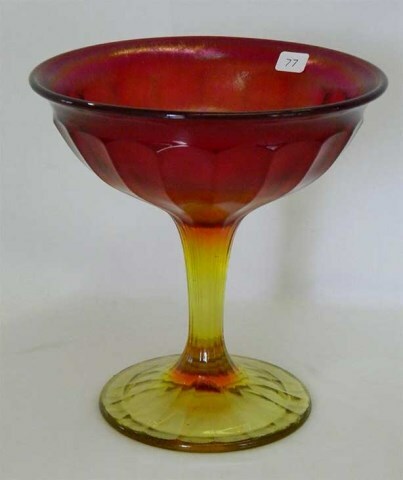 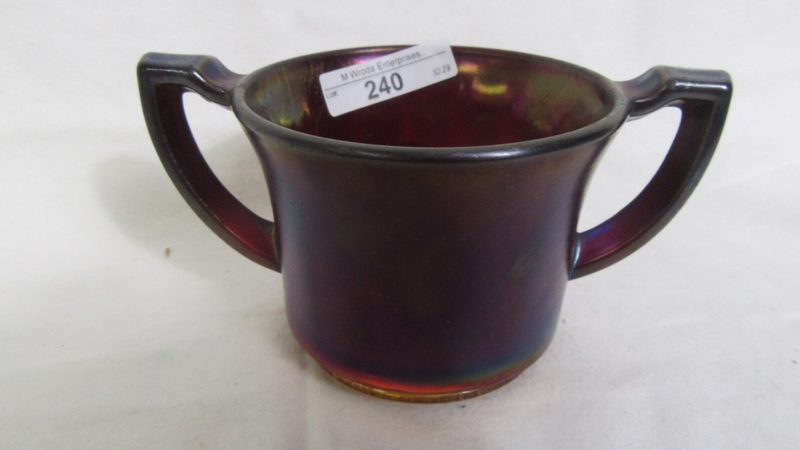 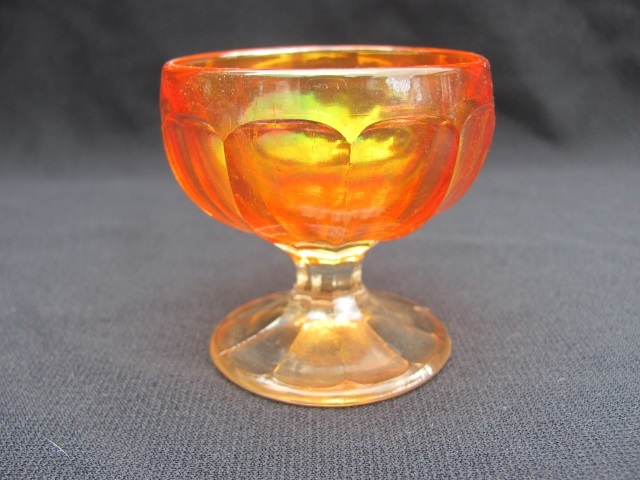 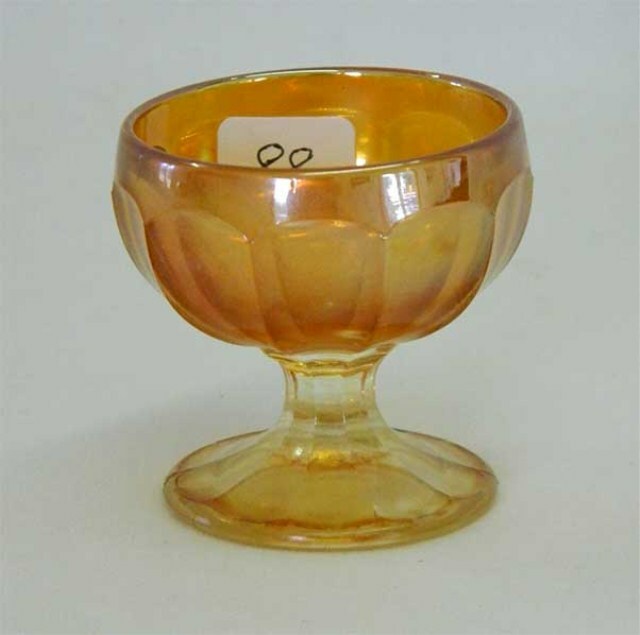 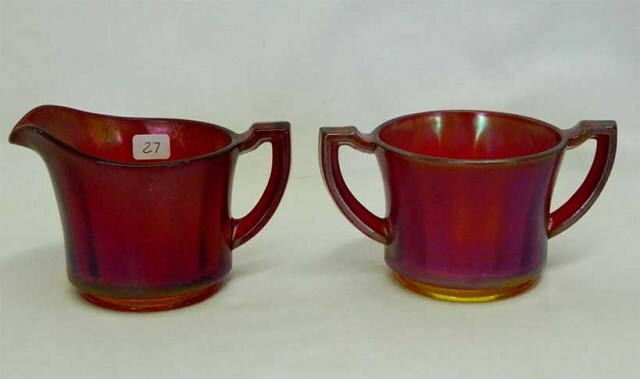 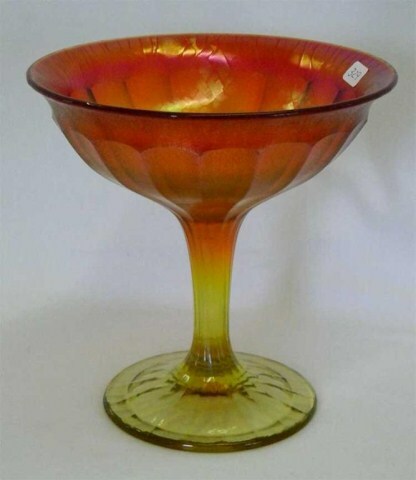 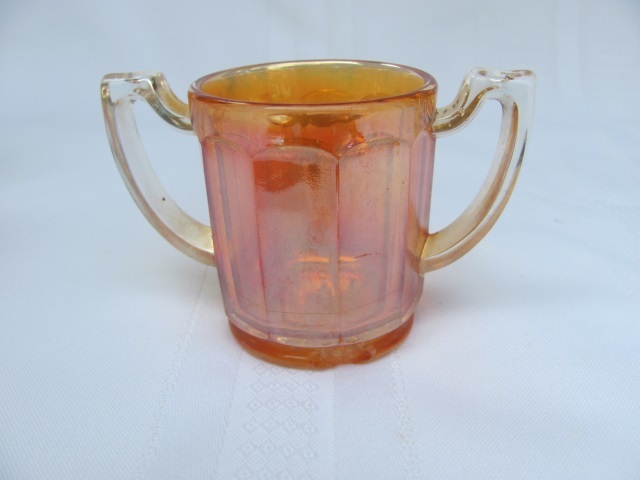 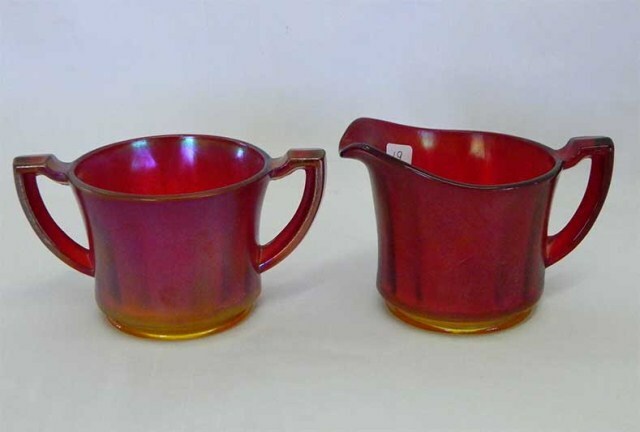 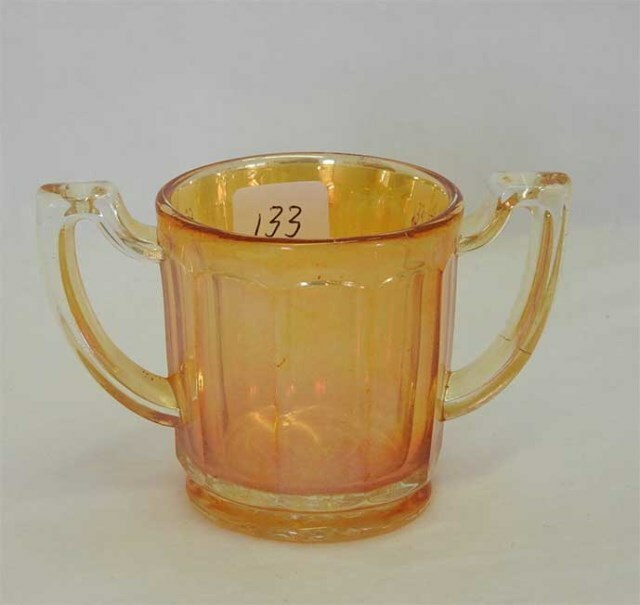 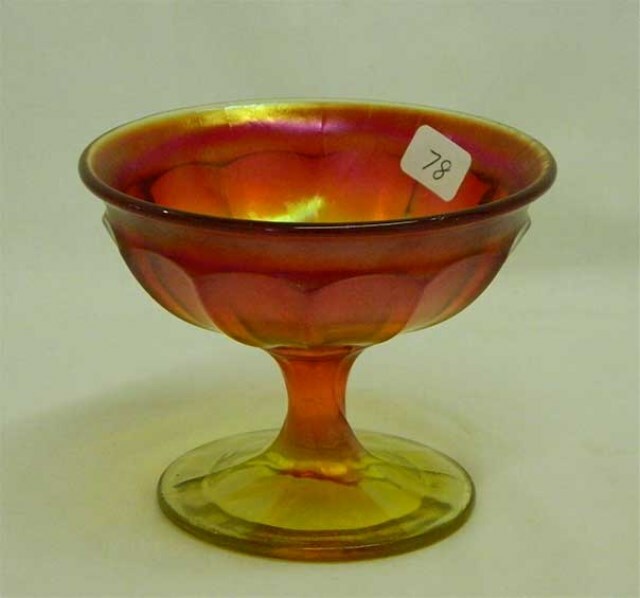 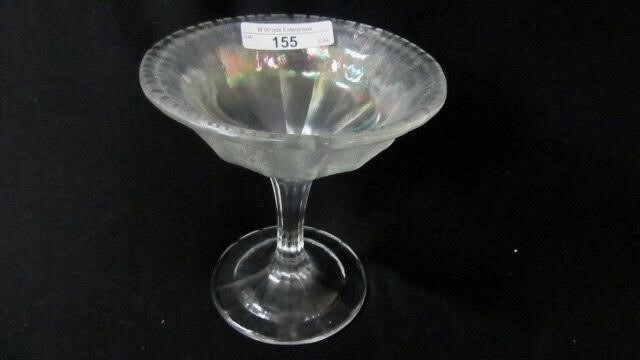 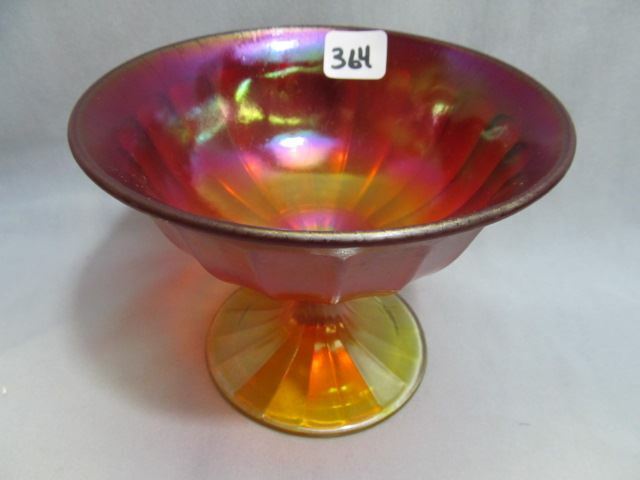 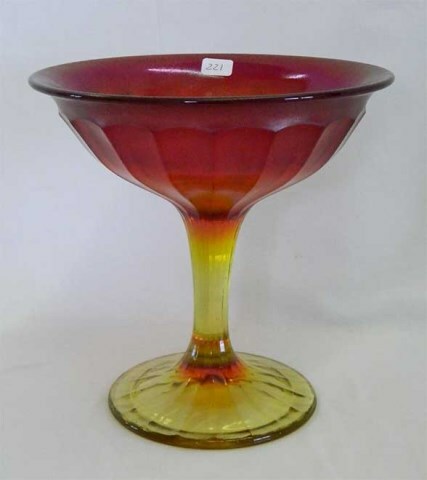 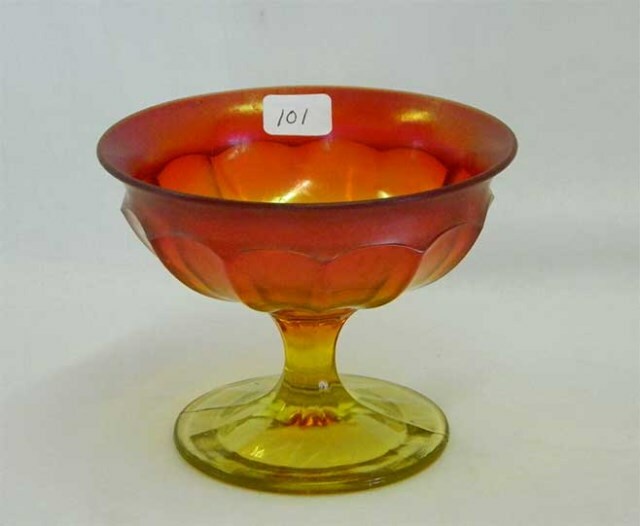 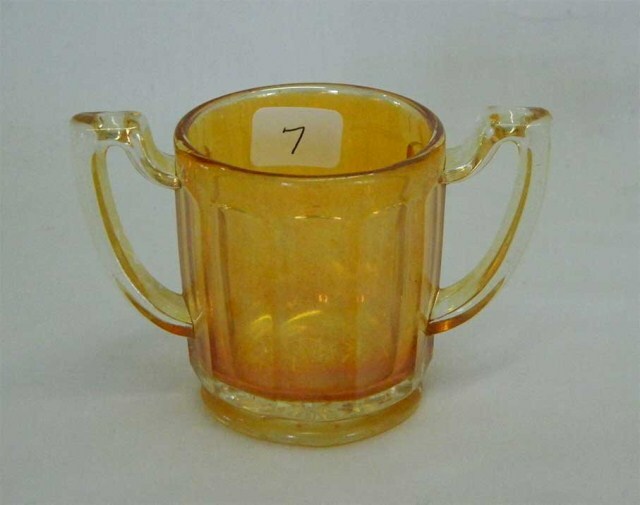 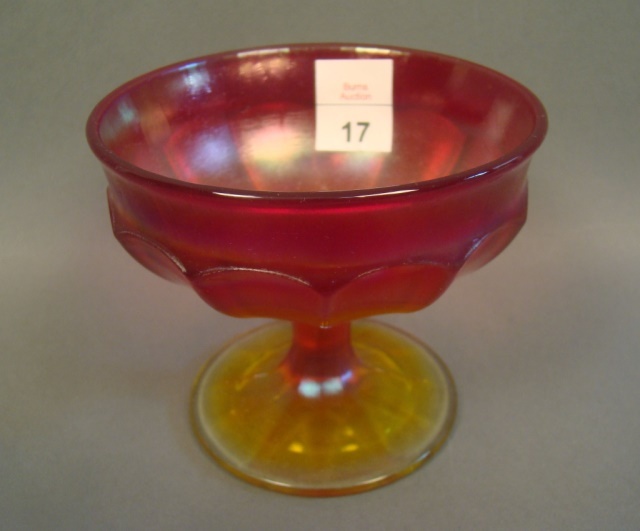 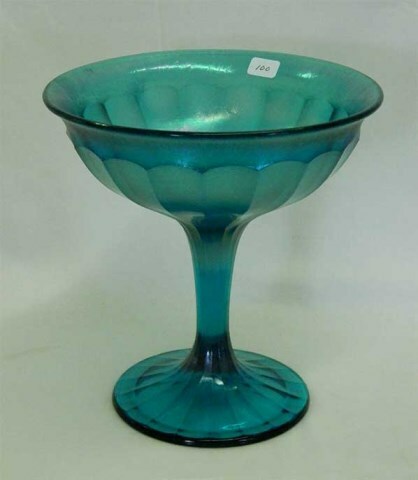 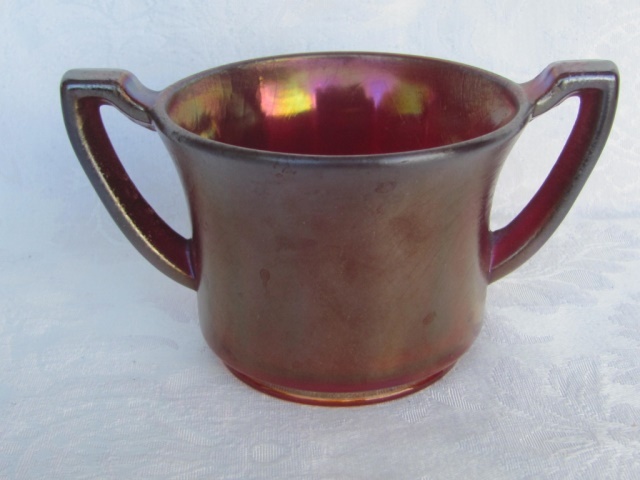 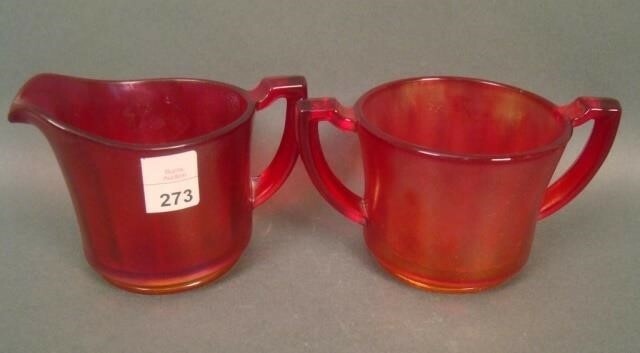 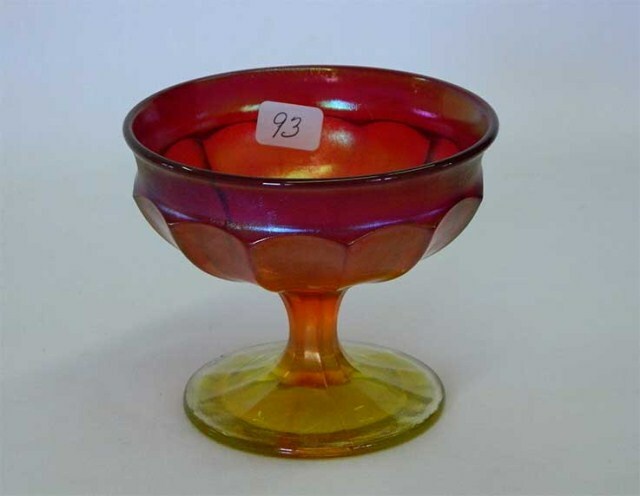 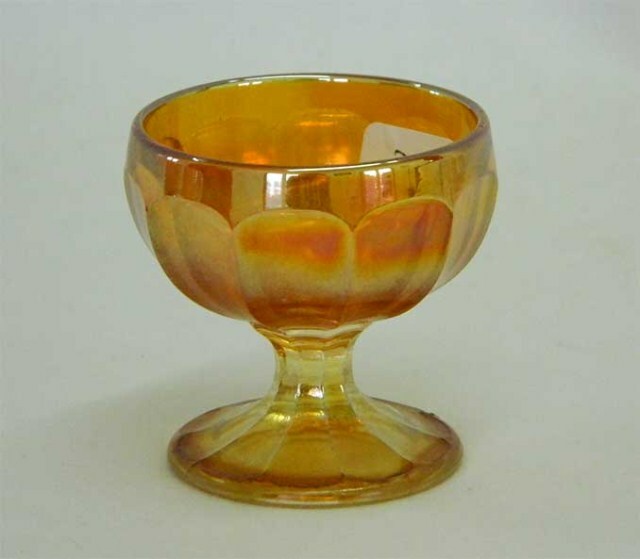 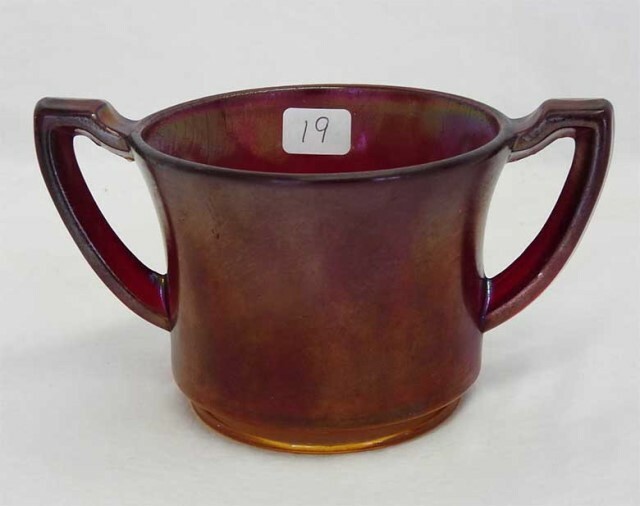 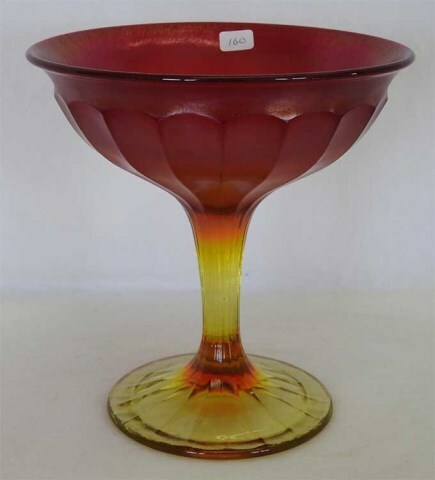 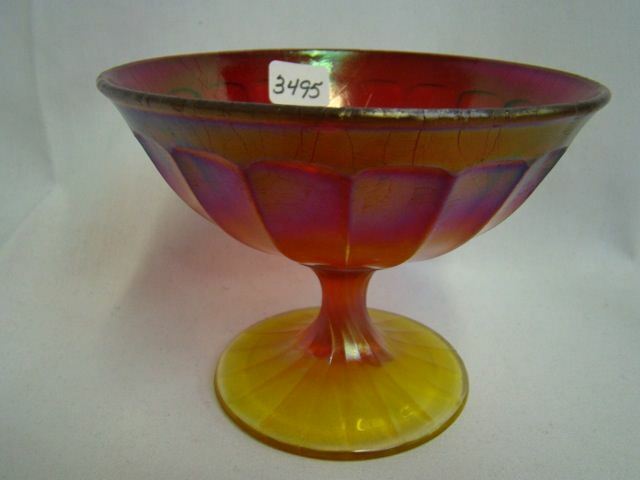 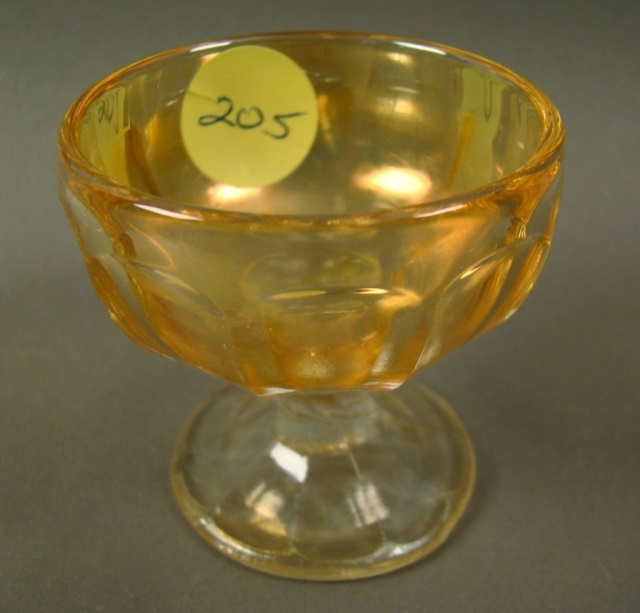 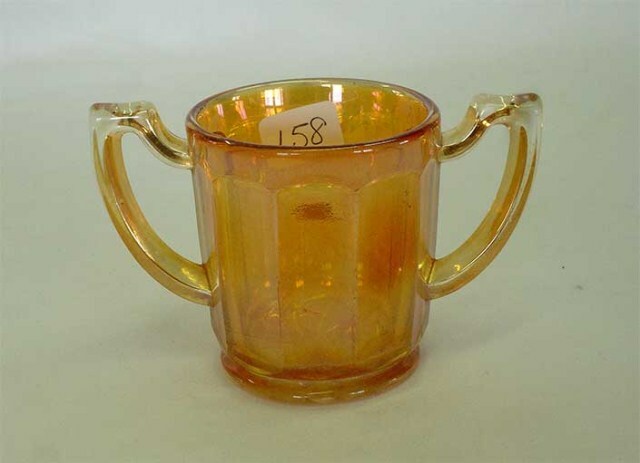 In 2015 a Seeck auction listed a ‘small sized tumbler marigold – has Imperial Cross mark' – it sold for $80. 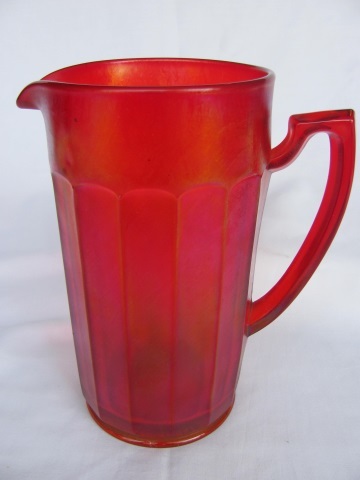 The actual height was not documented. 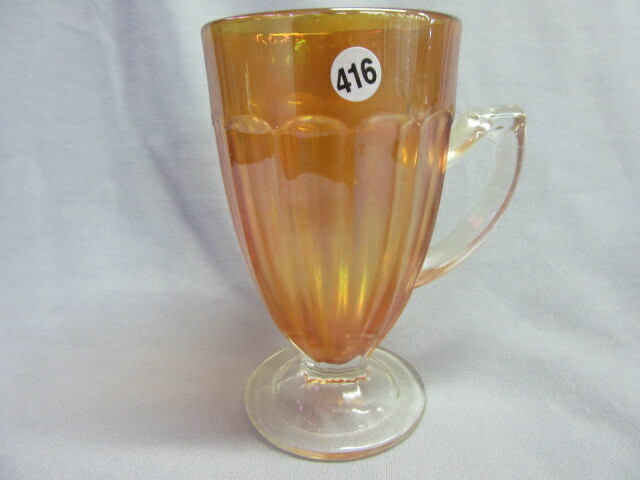 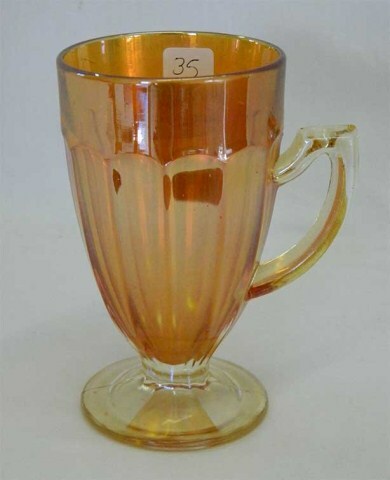 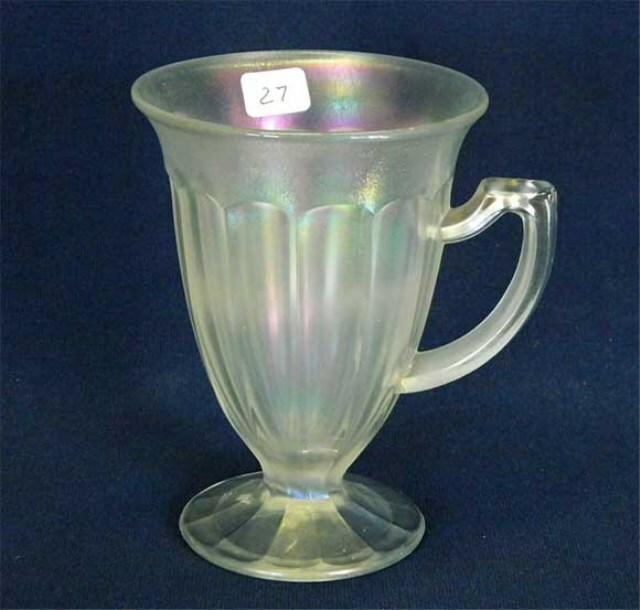 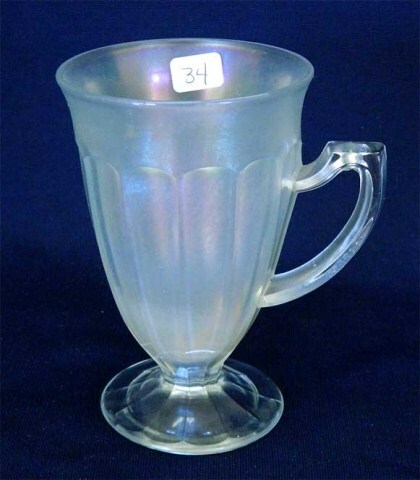 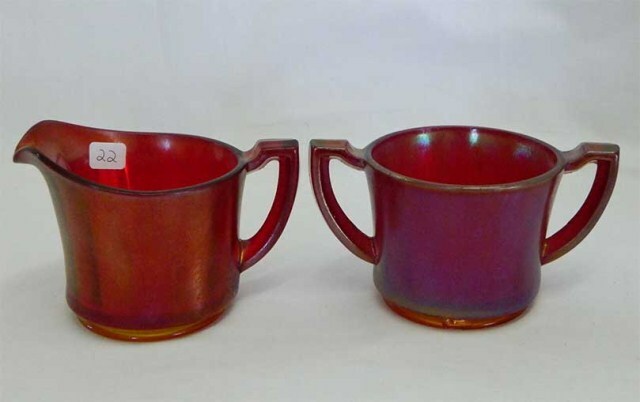 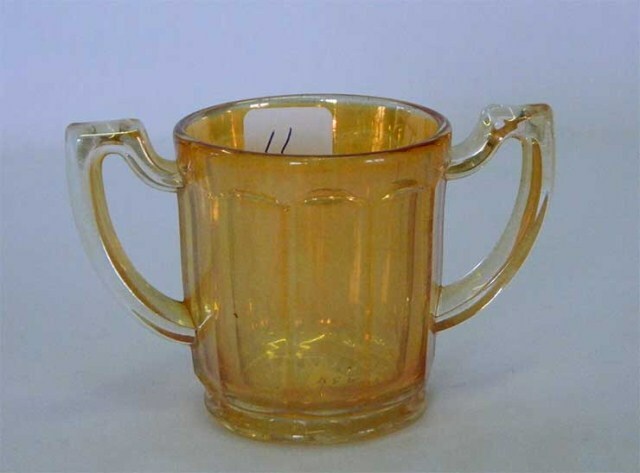 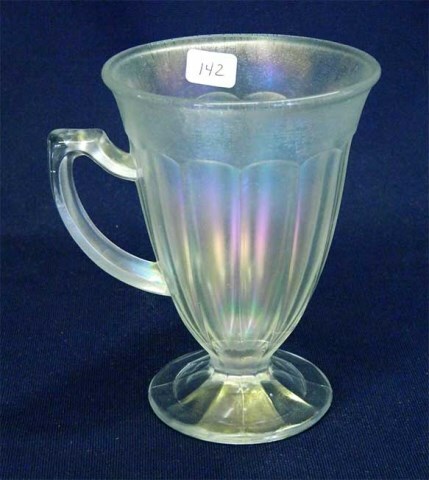 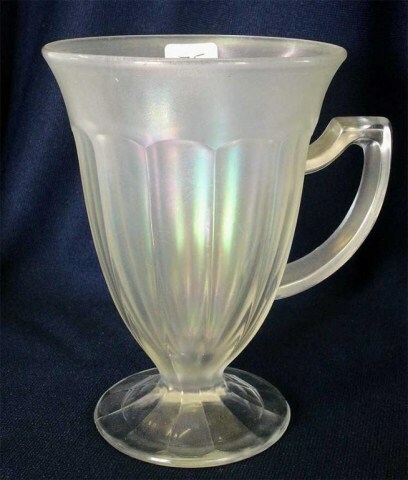 The normal tumblers are sometimes referred to as lemonade tumblers – their base size is 2 1/4 inches and the height is 5 1/4 inches tall according to the Shetlar stretch glass website. 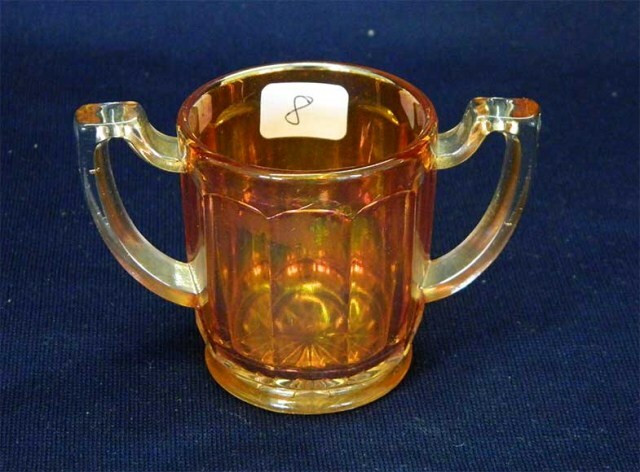 Shown above are a 2 inch tall individual salt in the Chesterfield pattern (courtesy of the late Jack and Eleanor Hamilton), and a toothpick holder that sold in 2003 for $195. 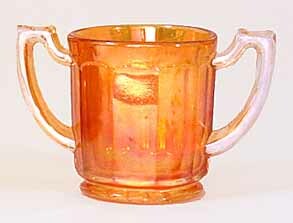 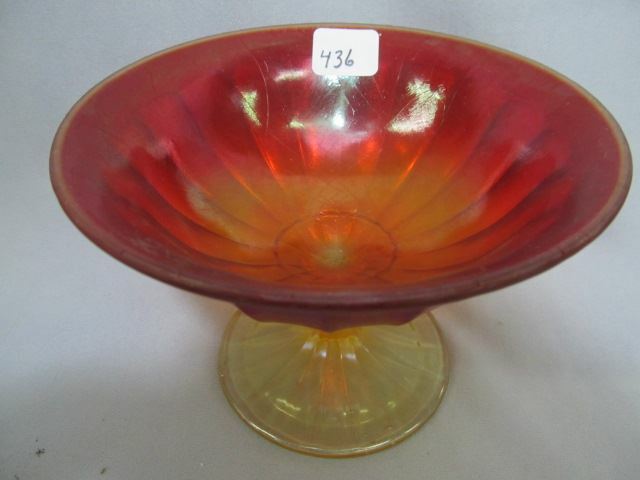 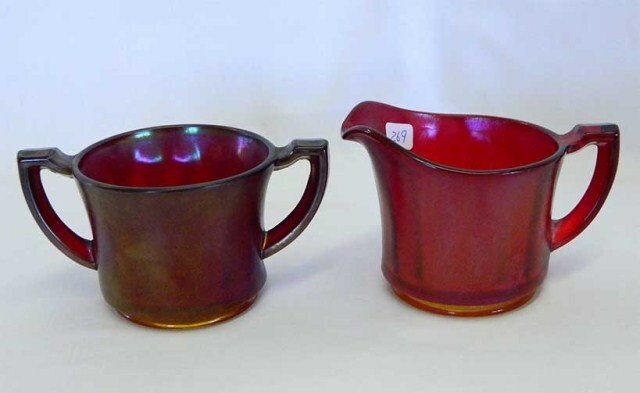 Marigold salt dips sold in 2012 for $130 and $140. 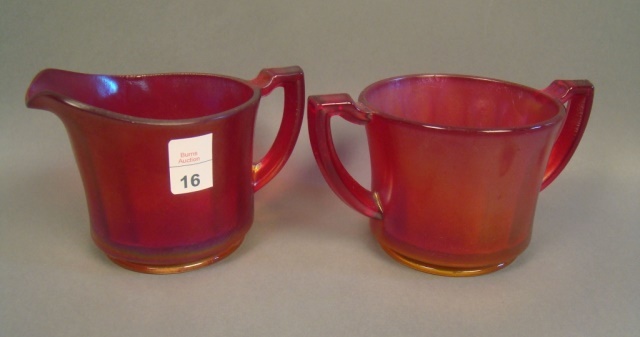 A purple salt dip sold in 2013 for $375.